Got some elk ribs from a buddy of mine. Slather rack of ribs with a heavy layer of prepared yellow mustard, rub on spice mixture, wrap tight with plastic wrap and refrigerate over night. 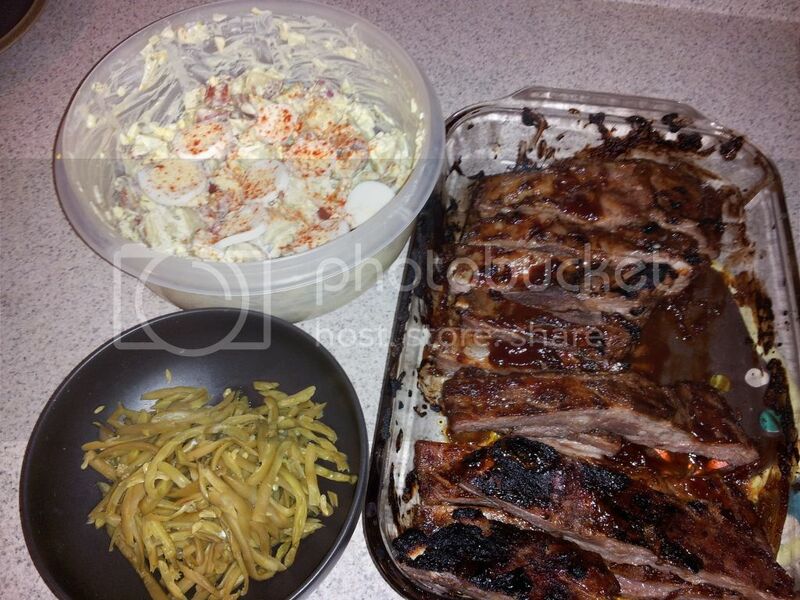 preheat oven to 230 degrees, wrap rack of ribs tightly in tin foil pouch and bake for 4 hours. carfully remove ribs from tin foil pouches slather with favorite bbq sauce and put on a HOT grill until the bbq sauce has been cooked onto the ribs.... I enjoy mine with some home made tater salad and green beans. Too bad we don't have elk hunting in Iowa. I may have to try that with some deer ribs. I generally cook deer ribs like you would cook a kidney........ boil the piss out of it! I didn't used to save the ribs because I never could get them to taste very good, until a guy told me how to cook them. Put them in a pot and bring to a boil. Boil for about 5 minutes then drain the water off and put fresh water back in. Bring to a boil again and boil for about 5 minutes. Boil, drain, add fresh water about 3-4 times. Deer fat tastes like crap! By boiling, draining, and adding the fresh water you're boiling out all of the fat in/on the ribs. Once done, put in the smoker or on the grill and add bbq sauce. Cook long enough for the sauce to caramelize. It'll make your tongue slap your brains loose! I'll be killing a deer tomorrow BC, i'll have to give that a try, i normally just cut the ribs up and smoke them for the dogs. You sound pretty confident about that. You got one tied to a tree somewhere? i got access to some private property, wheat and barley fields, i hope to have a deer hanging and i'll be back in the marsh killing duckies by 10am! I told the wife i wasn't coming home till i got one, so i aught to be home late sunday night! I will have to try that cooking idea with my next roadkill.